Up to this point, EA's Need for Speed series has mostly focused exotic sports cars and driving precision. 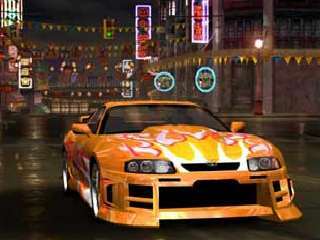 NFS Underground on the PS2 takes a distinctly different approach as you race on urban street courses and tracks to build your reputation. You drive in outlaw events to earn reputation, not trophies. Another big change lies in customization where you can mod vehicles with parts to increase performance and create a unique look with decals and layers of vinyl. This approach makes for refreshing installment in the series, but retains the high-quality presentation and fluid controls that have kept the series so popular. It's excellent graphics create a detailed environment while creating strong sense of speed. NFS: Underground is an excellent racer that combines fuel-injected gameplay with surprising depth. NFS: Underground takes players into the import tuner culture where driving style counts almost as much as winning races. You begin at the bottom of the racing scene and can work you up through the rankings by competing against other drivers in nocturnal contests that take place on the gritty, dangerous urban locales. In addition to the other racers, you'll also have to dodge oncoming civilian traffic and avoid hitting obstacles such as trees, guard rails and walls. Failing to do so will cause a mighty wreck and more spectacular significantly decrease your chances for winning the race. As you earn your way through the races, you can customize your vehicle by purchasing a variety of upgrades including engines, tires, nitro upgrades and more. You can also purchase new vehicles and trade in your old ones. 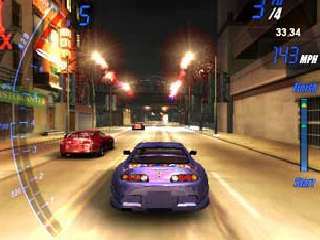 The game includes more than 20 vehicles from real-world manufacturers such as Honda, Nissan, Toyota and Mitsubishi. In addition to after-market parts, you can also purchase a variety of decals to paste to your car, add layers of customized vinyl and more to give your car a unique look on the street. This is a cool idea and allows gamers to be creative. Since there are hundreds of mods at your disposal, the options are nearly limitless, which lets you create a vehicle you can call your own. Modifying your car results in more than just visual eye-candy and actually affects gameplay. The more you customize your car, the more reputation points you earn. Higher rankings affect your standings in two ways: with higher score multipliers and by allowing you to enter tournaments. You'll have to achieve a minimum star ranking, since 'uncool' cars aren't allowed to race. Using the reputation ranking as a means of entry makes this more than superficial, and is a clever way of integrating car mods into the gameplay and they effectively enhance NFS: Underground's rebellious spirit. You can select from several different modes including Quick Race, Arcade, and a Head to Head mode where you can challenge a friend via split screen. There are also some cool variations in the game as well. Most of these take place in the same city circuit but players will face a number of interesting challenges and gameplay twists. Knockout races don't allow you to hang back and make your move at the end of the race because the car in last place after each lap is eliminated. Players can also race in point-to-point races where you have to beat the game in a single run. 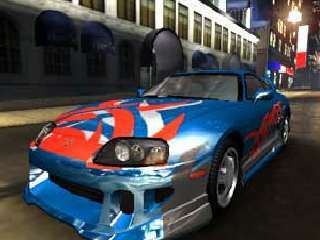 NFS: Underground's Drift challenge mode is quite addictive. Here you have to earn a set number of points by drifting or power sliding around corners. You compete purely on points and style matters, not speed. NFS: Underground also includes intense drag races where you have to compete with rivals on a long strip. The goal here involves accelerating as fast as you can while trying to time the shifts perfectly. This seems simple enough, but changing gears at the precise moment leaves you with no room for mistakes. Finally, the heart of the game lies in the Underground mode, which is where you compete in a series of races and the only way to unlock vehicles and tracks and earn upgrades. After you have completed each race in the Underground level, you compete in the climactic multi-race tournament, where you compete against three other rival drivers. You are given points for each race and the driver with the most points at the conclusion of the tournament is the champion. Despite its arcade feel, the gameplay itself offers a surprising amount of depth on the track. In addition to earning points in the traditional methods of winning races and completing challenge levels, players earn extra respect by driving with style. Respect is earned by drifting around corners, drafting behind other vehicles, racing a clean line and avoiding other vehicles. This requires skill because you have to master a variety of techniques in order to succeed. Luckily, these driving techniques are easy to get the hang of thanks to the fluid controls. The vehicles feel authentic because each performs quite well on the track, responding realistically to your commands. While the controls seem a little touchy during the early levels, once you've upgraded your vehicle, you can feel the increased performance immediately. The better cornering, tighter turning and easier drifting is worth the upgrade, and the increased speed makes things even more intense. The most difficult technique to learn is timing drifts effectively. It takes some practice to be able to turn effectively, but the game is quite accessible. 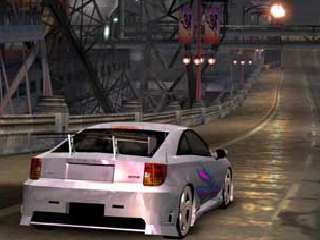 NFS: Underground isn't a simulation however, and the arcade-style feel allows you to focus on the action. NFS: Underground is quite addictive as a single player mode, but the game adds value because it also includes an extensive online mode where you can compete against four other internet players head to head. You'll need a broadband connection and will have to log into the EA Sports website to register an account, but its definitely worth it thanks to the seamless, lag-free play which makes the online experience just as intense as the single player mode. Logging on to the system is a snap, and setting up games, making rooms and chatting with other players is surprisingly easy. This is an excellent addition to the game, and adds a new dimension of competitiveness to the proceedings. From a graphical standpoint, NFS: Underground excels at creating a believable, cohesive racing world. The game's urban environment is richly detailed with outstanding lighting effects, realistic water and detailed trackside objects creating an authentically gritty feel. Obviously, the car models are the game's centerpiece and each is modeled beautifully with reflective paint, colorful decals and reflective windows that gives them a realistic look. The developers have achieved a convincing sense of speed with a smooth frame rate that gives you an immediate rush, especially at faster speeds when the screen starts to blur. Players can select from a behind the car perspective or a first person view, with the latter offering an intense experience. The course layouts are excellent as well. Most of the action takes place within the confines of the same city, the courses branch and feature numerous short cuts, which adds to the challenge. Complimenting the game's underground feel, a number of high-intensity music tracks which run the gamut from hip-hop to rock to techno. Since this is an EA game, many recognizable artists such as Mystikal. Crystal Method, Rob Zombie and Rancid are included as well as more obscure acts. This is a balanced soundtrack, and you can choose which ones play during the race, or can choose to play with no music at all. Overall, the game's visuals and soundtrack offer a highly polished, realistic sense of speed throughout. NFS: Underground is more than the sum of its parts. The vehicle customization options are extensive while the varied racing styles keep your interest level high. The tight controls, responsive steering, and exciting gameplay make for a surprisingly addictive and challenging racing title that offers more than just a quick jolt of speed. Mastering the drifting techniques, finding the best lines and discovering shortcuts adds to the gameplay's depth. Adding drifting, drag and point-to-point races lessens the repetitiveness that inevitably occurs in most racing titles, keeping things engaging for quite some time. 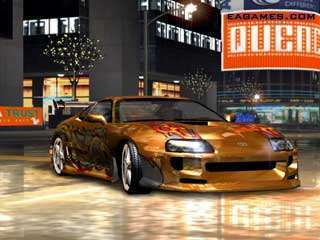 NFS Underground is an exciting and intense racer, with excellent graphics, detailed environments, and a cohesive design that creates a convincing and intense sense of speed. Allowing you to create and race a customized vehicle that looks and performs exactly as you want it is probably its strongest point, helping the game to stand out from the pack of other extreme racers. NFS: Undergrounds' accessible controls and sense of speed are immediately appealing, yet offers enough depth and options to keep you playing for quite some time. It's definitely one of the best PS2 racers to date and is highly recommended for all racing fans looking for an intense, exciting game.